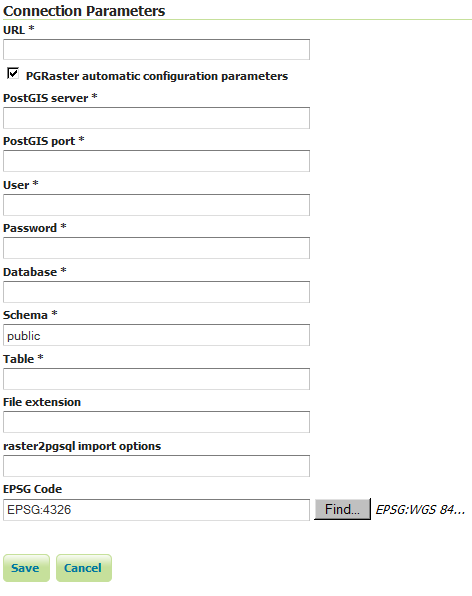 The PGRaster geoserver module adds the ability to simplify the configuration of a PostGis Raster based ImageMosaic-JDBC store. Before proceeding, make sure to take a look to the PostGis Raster plugin documentation for background information. Note that configuration files, table creations and raster imports explained in that documentation, will be automatically handled by this module. create the imageMosaic JDBC XML configuration containing PostGis database connection parameters, attributes mapping and coverage configuration. 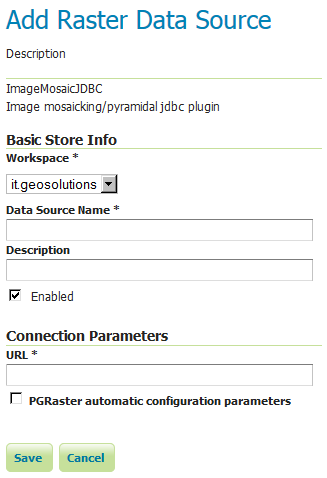 configure the imageMosaic JDBC on top of the newly configured XML. You must have a PostGIS 2.0 database where your raster tiles will be stored. Raster tiles should have been previously created using gdal_retile since this module will simply import them and configure the store. The ImageMosaic JDBC setup example documentation provides examples of how to do that. In case you want to perform automatic import of the raster tiles into the database, you need to have raster2pgsql and psql executables installed on your machine and configured on your PATH. (In case your PostGIS 2.0 installation is on the same machine where you will run GeoServer, the executables should be already available). Download the pgraster community module for your version of GeoServer from the download page. Unzip the archive into the WEB-INF/lib directory of the GeoServer installation. Select ImageMosaicJDBC. You will see the usual “Add Raster Data Source” form. For backward compatibility, you may still configure an ImageMosaicJDBC in the old-way, by specifying the URL of a valid XML configuration file, as done in the past (Where all the components of the ImageMosaicJDBC need to be configured by hand by the user). Notice the presence of a checkBox which allows to proceed with the PGRaster automatic configuration parameters specification. Once Clicking on it, you will see a set of new parameters for the automatic configuration step. When enabling that checkBox, the URL parameter needs to point to the main folder containing the rasters which have been previously produced using gdal_retile. Right now it doesn’t allow to import data folders which have been created with the gdal_retile’s useDirForEachRow option.